Nitric oxide (NO) plays an important role in the integration of information processed by the basal ganglia nuclei. Accordingly, considerable evidence has emerged indicating a role for NO in pathophysiological conditions such as Parkinson’s disease (PD) and other neurodegenerative disorders. 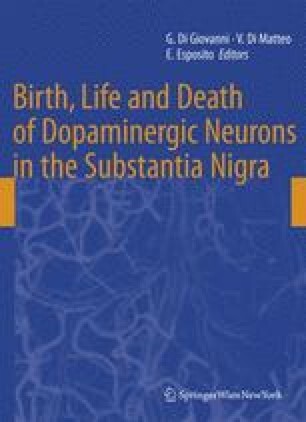 Despite these recent advances, the nitrergic modulation of the dopamine (DA) nigrostriatal system is still unclear. In order to fill this gap, in this study we used in vivo electrophysiology and ex vivo neurochemical analysis to further investigate the effect of NO signaling in rat substantia nigra pars compacta (SNc) and the striatum. Acute and subchronic (4 days) pharmacological manipulation of the NO system using 7-nitroindazole (7-NI, 50 mg kg−1 i.p.) and molsidomine (MOL, 40 mg kg−1 i.p.) treatment caused significant changes in both DA SNc neurons electrophysiological properties and striatal DA and 3,4-dihydroxyphenylacetic acid (DOPAC) levels. It is worth noting that acute inhibition of NO production decreased DA nigrostriatal neurotransmission while its subchronic inhibition was instead excitatory. Thus, a crucial role for NO in the modulation of nigrostriatal DA function is suggested together with a potential role for inhibitors of NO sythase in the treatment of PD. This study was supported in part by Ateneo di Palermo research funding, project ORPA068JJ5, coordinator G. D.; G. O. was supported by an Italian Ministry of the University and Scientific Research fellowship (Tutor: G. D.).